Note: This article will outline how to reset a forgotten password to log into the My Rehab Connection web portal. For information on resetting a password to log into the My Rehab Connection patient app see “Recovering a Patient’s Password’). From the My Rehab Connection login screen simply enter your login email and password. If you enter the wrong email you will seen an invalid password error message. 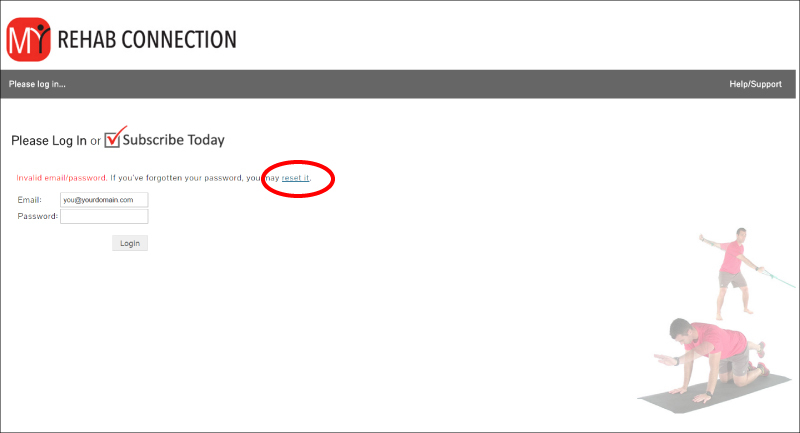 Click on the ‘reset link’ and enter your login email. A new temporary password will be sent via email. After logging in using the temporary password you will be prompted to create a new password.